Composed by Bob Good. Contemporary Classical, Repertoire, Recital. Score, Set of Parts. 5 pages. Published by Surrey Dance Music (S0.432593). 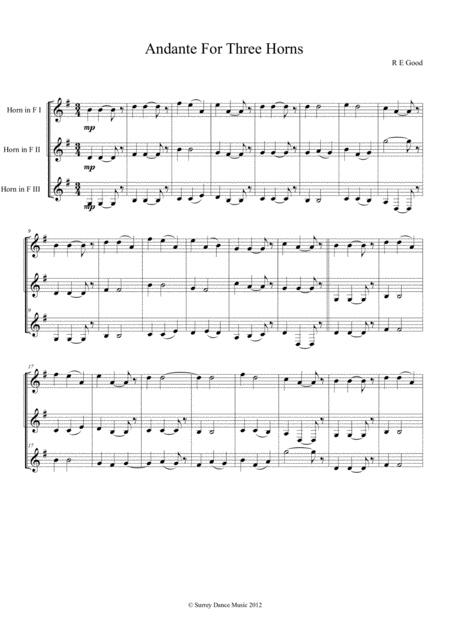 Arrangement of "Andante for Three Cellos" for French Horn Trio (which explains why the audio clip features cellos. Duration typically a few seconds under three minutes.